Light pink, baby pink, or blush tones, whatever you like to call it, it’s my favorite color for Valentines’ Day. 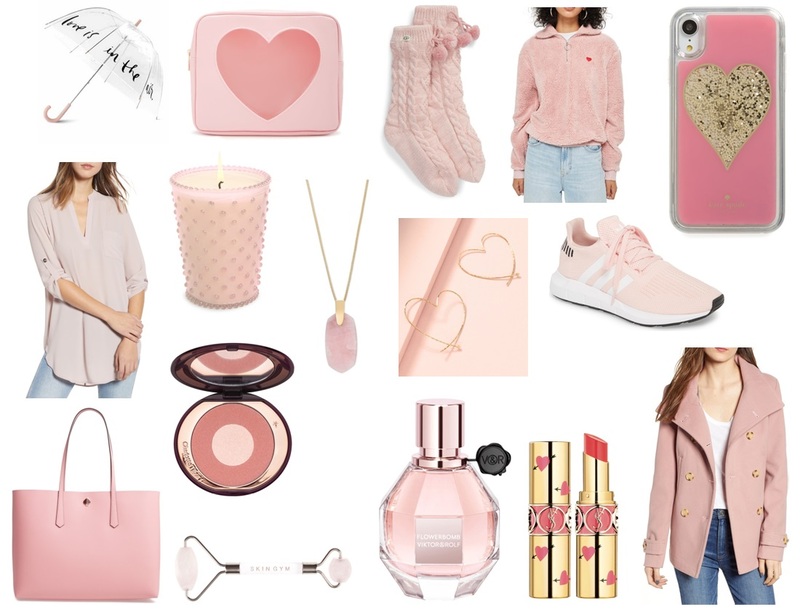 So I put together some gift ideas for all the ladies out there, revolving around this soft girly color. I have to say Valentine’s Day is still one of my favorite holidays. It’s the day my husband proposed 7 years ago, so it will always be a special day to me. And even though its my favorite I don’t like to buy things I can only wear or use once a year, so everything I’m featuring are things that can worn or used year round. 1.Kate Spade Leather Tote – This is one gift idea that is defiantly a splurge. This tote from Kate Spade is simple, sleek and large enough the hold everything you could possibly need…am I right mamas 😉 It also comes in 5 other colors. 2.Makeup Bag– This makeup bag also comes in black and is very affordable. I love the simple see through heart detail. Great for traveling. 3.“Love is in the Air” Umbrella – Another Kate Spade item on the list is this fun umbrella. It’s such a different kind of gift idea, that is so cute and again not over the top “Valentinesy.” It’s something that can be used all year round. 4.Candle– I feel like gift wise you can never go wrong with a candle. It’s a gift that keeps on giving. This candle is from Nordstroms and comes in 13 other colors, perfect to match any decor. 1.Blush Color Pea-coat – Love this double breasted Pea coat by BP. On sale for only $37.90!! Comes in black, tan, and charcoal as well. It is a great staple for this time of year. 2.Pink Blouse On Sale for ONLY $19.90. 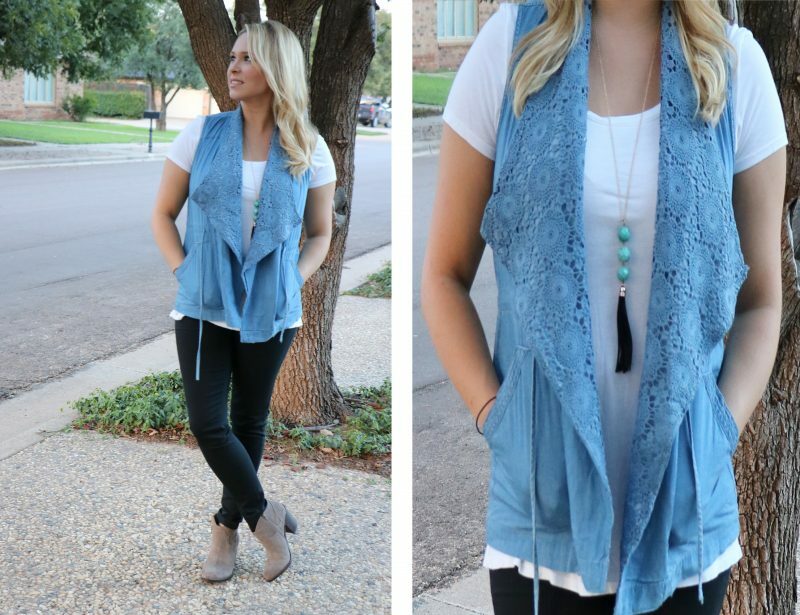 Love this longer blouse that can easily be layered and is great paired with skinny jeans. 3.Sweater – With this crazy weather everyone is experiencing, I wanted to include a casual sweater option. Love the subtle heart detail. 1.Victor Rolf Perfume – On to the beauty portion of the post. I had to include one perfume that I am currently loving. Its such a beautiful feminine smell. I think a perfume is always a great gift idea, you don’t have to worry about sizing issues but yet it’s still a very personable gift. 2.Skin Gym – One new hot beauty item that’s out right now that I have been very curious about, is this the face roller by skin gym. Yes, I said face roller. It’s something I have not used, but one that seems very intriguing to try. It is made with rose quartz and is used to apply face lotions or serums. If this is something you have tried, and would recommend let me know. I am always interested in finding new beauty buys. 3.YSL Lipstick – One little beauty item that I think is a great gift idea for someone that is a make up lover, like myself, is this lipstick by YSL. A high end beauty product is a always great gift idea, especially if you know that, that person wouldn’t buy it for themselves. 4.Charlotte Tilbury Blush – This blush is one of the best sellers from the Charlotte Tilbury line and is in the shade “pillow talk.” It is a very flattering universal shade that fits most skin tones. They also have the same shade in a lipstick and lip liner. I love that you can buy the complete trio and have a very natural make up look where all the shade compliment one another. 1.Heart Hoop Earrings – Love these Stella & Dot simple heart hoop earrings… (try saying 3 times fast) that are perfect for Valentines day. They also come in silver and there is a matching necklace to go with it. 2.Kendra Scott Necklace – Here in Texas Kendra Scott is well known and one of the best gifts you can give someone. This is one of the new necklaces she has out and I am loving all the shades. Check out the link to see more colors. There are also earring to match. 3.Pink Adidas Sneakers – Love these light pink sneakers from Adidas. These are the perfect gift for those ladies that are always on the go. They also come in 5 other colors. Click the link to check them all out. 4.Cozy Knit Socks– One great gift idea for this cold month are cozy socks and when I mean cozy, I mean cooozzzy. These UGGs socks are a great gift idea for anyone out there like me, that lives in comfy socks or slippers around the house. 5.Phone Case – Another Kate Spade item I had to mention is this fun glittery heart phone case that is a perfect gift for that friend that loves to be on their phone. After all, it is considered an accessory these days. Hope you enjoyed some fun gift ideas for Valentines day. If you got this far in the post thank you, thank you!! I always appreciate you stopping by. 🙂 Stay tuned for part 2 of Valentine’s gift ideas. The 2018 Nordstrom Anniversary Sale is Here!